Fort Worth is a delightful paradox. It’s a city both steeped in western heritage and loaded with museums and galleries. And why can’t you have the best of both worlds? Here are eight places where you can view and purchase Western art. From posters to oil paintings to vintage and historical prints, there’s a little something for every Western art lover to buy. There are also more sophisticated mixed media pieces, like James Moore’s Spring in bronze on stone and Tammy Lynne Penn’s radiant Together We Fly in bronze. The Western art collector or native Texan in your life is going to love the replica of the John Arrowsmith 1841 map of the Republic of Texas, which shows Texas’ claim to the upper Red River area and into what is now New Mexico. The Museum houses premier examples of American painters of the 19th and 20th centuries whose art features the American West. Close to 400 works by Frederic Remington and Charles M. Russell, arguably the two greatest artists of the American West, are housed on the Museum&apos;s mezzanine level where four small gallery spaces are devoted to the their works. The wall-mounted, pull-out drawers reveal Russell’s very illustrated letters and other ephemera. Thanks to the generosity of museum patrons and sponsors, admission to this beautiful space is always free. 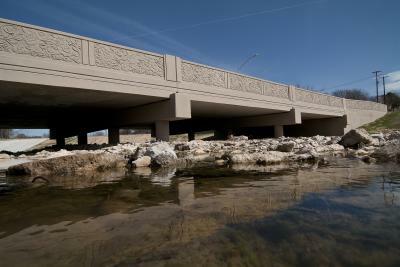 Art is everywhere, even on our bridges. The Dewey Street Bridge showcases artist Leticia Huerta’s beautiful Leather Roses and Stars, a series of bas-relief images in the concrete which are drawn from the saddles and garments of cowboys and cowgirls of Fort Worth’s past. 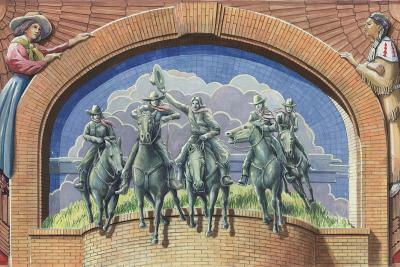 The piece is part of the Fort Worth Public Art Collection. The National Cowgirl Museum and Hall of Fame is a one-of-a-kind day trip though the history of women who shaped the American West. The museum houses a collection of 5,000 Western artifacts, along with books, archives and oral histories. The Hall of Fame is home to 228 pioneers, artists, writers, entertainers, humanitarians, business women, educators, ranchers and rodeo cowgirls including painter Georgia O’Keeffe, writer Laura Ingalls Wilder, Enid Justin - who created the multi-million-dollar Nocona Boot Company - Roy Rogers’ better half Dale Evans and U. S. Supreme Court Justice Sandra Day O’Connor. If you like what you see, you can buy prints, replicas of bronzes, and some cute clothing for your favorite cowgirl. 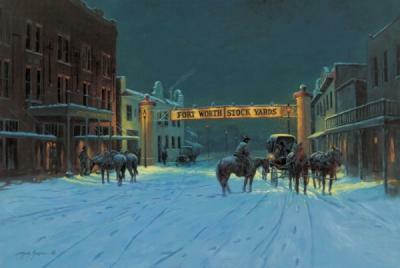 The Sid Richardson Museum houses the preeminent local collection of Western art in Fort Worth. 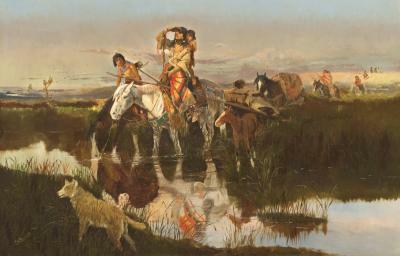 The museum is home to a permanent collection of works by Frederic Remington and Charles M. Russell, which vividly bring to life the romance of the American West. Legacy, one of the current exhibits, brings together the clashing forces that defined the West in the late 19th century: cowboys, Native Americans, the railroad and soldiers. And in an unusual twist, the second exhibit Frederic Remington: Altered States features artworks with alterations made either by the artist or by others. 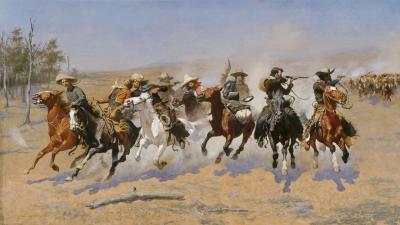 The exhibit contains three Remington paintings from the museum’s collection, supported with two loaned books from the Rick and Murfy Stewart Collection and two loaned bronzes from a private collection. 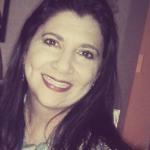 You can also purchase prints and replicas of the works you view. Admission to the museum, the legacy of larger-than-life oilman and philanthropist Sid Richardson, is free. For almost a century, Tandy Leather has provided Fort Worth and the rest of the country with high quality leather, tools, kits and other resources. 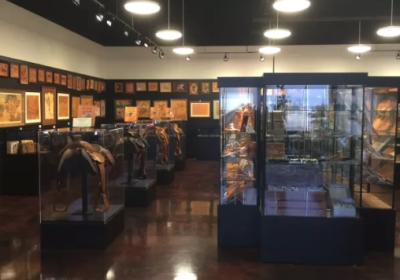 The Tandy Leather Museum is the area’s only exhibitor of handcrafted leatherworks, including items like belts, saddles, golf bags, a guitar case and something totally unexpected: hand-tooled pictures of western scenes. The largest, “The Brush Popper,” is a unique three-dimensional work of Western Art. Admission to the museum is free. 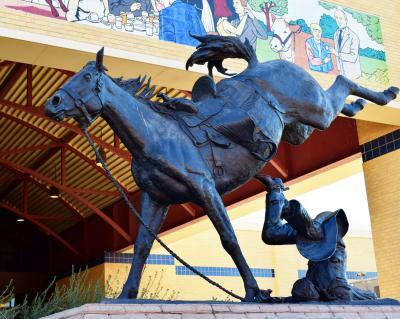 Finally, the Will Rogers Memorial Center is home to a variety of pieces of Western art, according to our friends at Fort Worth Public Art. The paintings are scattered through the Coliseum, the auditorium and the Equestrian multi-purpose building.